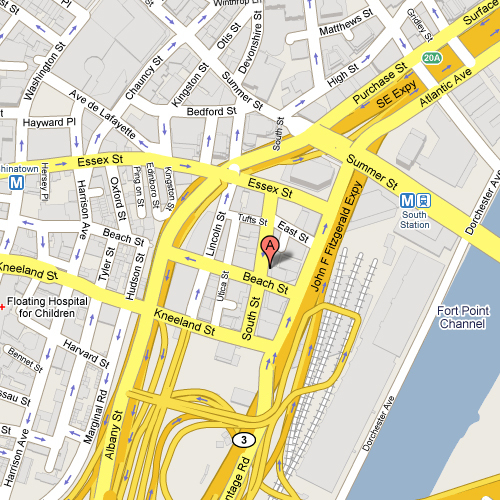 DIRECTIONS TO RAAB ASSOCIATES, LTD.
Take exit 24A to South Station. Go straight through the light at the end of the ramp and then take your second left onto East Street. At the stop sign, take a left onto South Street. #118 is on the left side of the street. Take exit 20 to South Station. Take exit off ramp towards South Station/Chinatown. Stay straight to Lincoln Street. Turn right onto Tufts Street. Turn right onto South Street. #118 is on the left side of the street, near the intersection with Beach Street. Take exit 20A. At the end of the ramp, veer left to go through the first light. Go straight through the first light and take a left at second light onto Essex Street. Take a right at the blinking light onto South Street.#118 is on the left side of the street, near the intersection with Beach Street. By Public Transit, we are only 3 blocks from South Station, where the Red Line, Amtrak and the Commuter Rail stop. Take the T Red Line (or Commuter Rail from the south) to South Station. Exit South Station at the door closest to the McDonald's. Cross Atlantic Avenue and turn left (walking against 1-way traffic). Cross East Street. Take a right on Beach Street for one short block. Take a right onto South Street and #118 is just a few doors down.